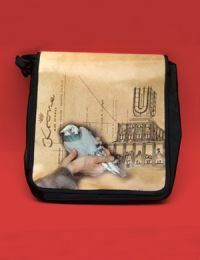 Unusual design for those who love the special things in life: shoulder bag printed with a sketched Dortmunder U and a pigeon. An extra special eyecatcher! Material: strong polyester: size upright: 33 x 35 x 9 cm. For all those wanting to show their love of Dortmund or looking for a nice present from the capital of culture region.